I received The New Four Magic Moves to Winning Golf DVD (and the rest of the hard copy products) this week in the mail with lightening speed. It took 6 days to arrive all the way from the USA to Western Australia. In my books that is very fast! I was very keen to check out this version of Joe Dante's golf instructional book for one main reason: Whilst some folks learn by reading books (ebooks or hard copies), not everybody learns the same way. Some folks prefer listening to instructions and following them at their own pace, others learn by watching how something is done, and others learn by a combination of some or all of these learning methods. That's why instead of ordering just The New Four Magic Moves to Winning Golf DVD, I decided to review the whole enchilada: the CDs, the hard copy book, and the Self Hypnosis Golf materials. That way, if you are thinking of getting one of Andy Brown's products, you will know what you're getting. Fair enough? Originally, though, I intended to cover all the products in one single review. However, I decided to divide the review into 2 parts. This part (the First Part) reviews only the products related to The Four Magic Moves to Winning Golf. I will deal with the Self Hypnotic Golf materials in the Second Part of this review, which I will publish later on (soon, I promise). Andy started selling this product as a digital download consisting of an ebook and/or a series of MP3 files that you could transfer into your Ipod ™ or MP3 player to listen the instructions at your leisure. I'll talk about the audio book versions later. I want to focus on the book itself now. The main advantages of buying the ebook are that you would get an instant download (no waiting for your postage to arrive), and you get the full version of the book (unlike Golf Swing Magic, which is an abriged (short) version of Joe Dante's book). You could then print out your copy, and take sections of the book with you. You could annotate your pages and, if you lose a page, you could reprint it. If you're good at learning through books, the ebook version may be for you. It works out cheaper and quicker. But you may not like printing out the book into a "loose leaf" version. You may end up missing pages, and having to reprint them again may not be your cup of tea. Also, having too many pages (usually printed out on one side) may not for you. If that's the case, the hard copy version may be for you. As you can see from the picture in this section, the book comes in a spiral-bound format, printed on both sides of each page in approximately 150 pages presenting the full updated content of Joe Dante's classic golf book. 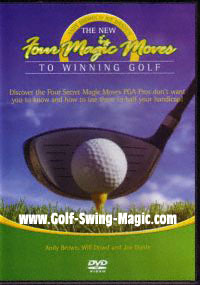 This full version includes not only the 4 Magic Moves, but also the complete Short Game, In and Out of Trouble, Timing & Rhythm, and Thinking Your Way Around sections.If you have gone through the abriged version of the book on this site, you can guess that the full version is good value for money. And here is a "Plus" you won't get anywhere else: Andy also sells a version of the 4 Magic Moves to Winning Golf for Left Handed players! I have not seen this version of the book, but I can see how handy this would be for a lefty in a right-handed dominated world! If you're a left handed golfer, you should check out that option if you decide to buy the book in either version (hard copy or ebook). Do you learn better by listening than by reading? 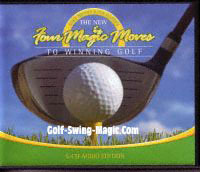 The New Four Magic Moves to Winning Golf is also available in a set of 5 CDs, which you can listen to on your way to work, or when going to your favourite golf course. And in case you're wondering, the book is read by Matthew Porter, and not by Andy Brown himself. I do not mind Andy's British accent. If you visit his site you'll be able to hear it. But that is not the accent you'll hear. The reader has a clear American/Canadian accent which is easy to follow and digest. Learning by listening is based on the "NET" principle ("No Extra Time"), that is the principle of learning something whilst you do something else such as walking, driving or travelling. I often do this when I go to work by train. If I don't feel like reading, I listen to my audio files. Carpe Diem, my friend, Carpe Diem ("Seize the Day! ", i.e. seize every opportunity you have to improve yourself!). The whole book is read out in 5 hours and 12 minutes (divided, of course, into eleven chapters that range from as little as 14 minutes to as long as 46 minutes). I don't know about you, but my attention span when listening to instructions does not go beyond 20 minutes. If a set of instructions is likely to last longer than that, I would have to break it down into small amounts. I would not try to listen to the whole book (the 5 CDs) at one time, though. You could overload yourself and get sick of it. Like in everything else, digesting this format works better in moderation. I previously mentioned that Andy used to sell the book in MP3 format, but I'm not sure if he still does. If that's the case, that's a shame, as I find that MP3 audiobooks are easier to transfer and listen to. Besides, the advantage of buying the book in that format is the immediate delivery. In any event, and depending on the copyright laws of your country, you could still get the CDs and then rip the audio files into MP3 files for your own use. You can do that with ITunes ™ or any other similar audio application. 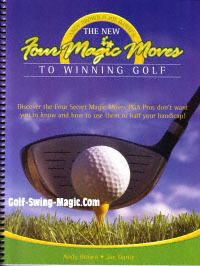 If you are the type of person who learns physical stuff by watching and practicing along as you do, then the New Four Magic Moves to Winning Golf DVD is the perfect complement to the book for you. The main instructing star in this DVD is a PGA Professional dude by the name of Will Dowd, although Andy Brown himself also appears in several sections of the program. You may be wondering if you would be better off just buying the DVD, and forgetting about the book and/or audio book altogether, and that's a fair question to ask. After having watched the DVD, my conclusion is that whilst you could work with the information therein, you would do yourself a big disfavor by not getting the book itself and/or the audio book. That's because the DVD runs for only 35 minutes, and it concentrates specifically on explaining and showing you how to perform each and everyone of the 4 magic moves as Joe Dante intended you to do it. How to prevent "Power Leaks"
There's only one thing I was disppointed about with the DVD, and that may be a matter of opinion: It is short, and it focuses on the 4 Magic Moves. It does not discuss the rest of the book. I think it would have been great to have the PGA Professional dude explaining Joe Dante's tips on the short pitch, the chip, putting and the green-side trap (Chapter 8 of the full version of the book). It would have also wonderful to have him explain how to handle woods and the rough, fairway traps, obstructions and lies of all kinds (Chapter 9 of the full version of the book). Finally, it would have been fantastic if either Andy Brown or Will Dowd had spent sometime talking about Dante's tips on the "Late Hit" (Secrets of Timing and Rhythm, Chapter 10 of the full version). Sure, you already get that information in the full version of the book. But as I said before, some folks prefer being shown, rather than reading. Besides, I was actually expecting the whole enchilada in his DVD. Maybe Andy's planning to do a follow up DVD with these topics in mind. But if he does, I would expect him to make you a deal you can't refuse if you're an existing customer. At this point, of course, that's only speculation. You may be expecting me to rave about how good the product is, and how it cuts so many strokes from the score. But everybody else does that when they're reviewing something, don't they? If followed to the letter, and if followed consistently, The 4 Magic Moves to Winning Golf does improve your swing. But you will only get from this method - or any other method thus far - what you put in it. In other words, if you're a golf instruction book/dvd junkie collector, it is unlikely you'll improve your golf swing at all. It doesn't work like that. You have to put some elbow grease. You've gotta work for it. You've gotta earn it! Therefore, if you are looking for a magic bullet, a quick fix, or an instant cure to your slice... forget it. Save your money, and keep dreaming. Neither the book nor the DVD will help you. Trust me on this one! But if you're serious about improving your golf swing, give yourself a chance and get the book and the DVD. Take advantage of the money back guarantee period and try it out. If you find the method has not helped you, you can ask for your money back. Seriously. Andy honors his promises. But if, after consistently training - as you should - you find that your game has improved, then you'll conclude that the money you spend on this materials will be money well spent. After all, you don't have anything to lose but your poor score! P.S. 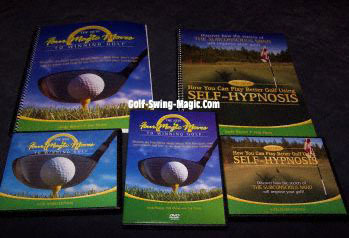 I'll Review the Self Hypnosis Golf materials soon. Keep tuned.